"The economy of these people must have relied largely on agriculture. Although no cereals were found in the course of excavating the discovery of a ploughed field , situated to the south-east of the settlement outside the town-hall, is highly significant. The field showed a grid of furrows, with one set, more closely spaced, running east-west, and the other, widely spaced, running north-south. Curiously enough, this pattern bears a remarkable resemblance to modern ploughing in the neighborhood, where two types of cereal (pulse in one direction and mustard in the other) are grown in the same field, the combination depending upon the size and growth of the plants. 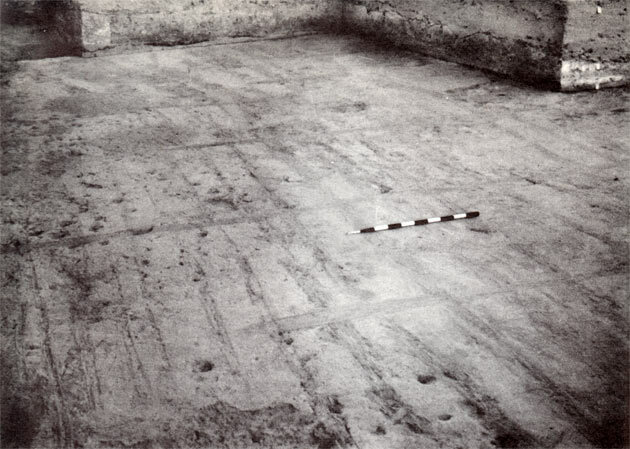 No remains of either a plough or a ploughshare or a coulter have, however, been obtained from the excavation, but the existence of a field showing tolerably well-preserved furrows provides concrete evidence for the use of the plough. The material of which the ploughshare or coulter were made and its shape still remain to be known. Since cultivation during that period seems to have depended on flood-irrigation, supplemented by seasonal precipitation, it is reasonable to infer that only the winter crop, viz. the rabi, was grown, the sowing being done in the autumn after the river-flood, resulting from the tropical monsoon, had subsided." B.K. Thapar, New traits of the Indus civilization at Kalibangan: an appraisal in Norman Hammond, Ed., South Asian Archaeology, Noyes Press, Park Ridge, N.J., 1973, p. 89.